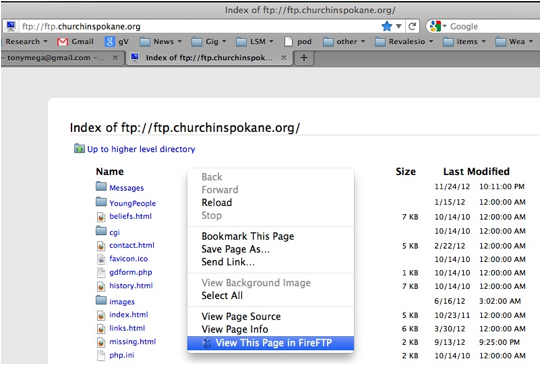 2) Go to ftp://ftp.churchinspokane.org/ and log in. You will need to know the User Name & Password. 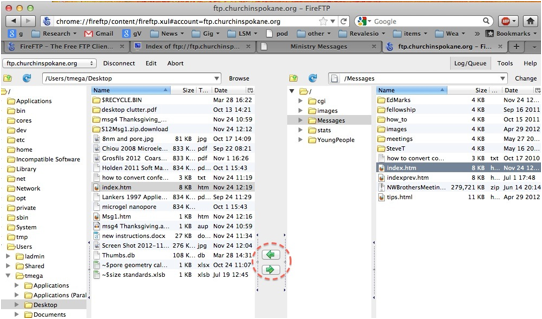 On the left side are files on your computer, on the right side you see files on the ftp site. We will now edit this file to put in the new links – and once we are done we will upload the changed version. But to be safe, we will now make a �back up� the original file so that if we make a mistake its not a disaster! Note: if you attempt to edit with another program, such as Microsoft Word, or an html editor, be forewarned that this may introduce a whole bunch of html code into the file without you realizing it. That will make things very complicated for the future – since html editors change all the time, I�m trying in these instructions to take a very simple, direct approach. 11) You then upload the modified index.htm folder on your computer to the website by the reverse of step (5) above – see that image above. That is, you highlight the index.htm folder on your computer and click the right green arrow to upload it to the ftp site. Here are some explanations of that html, which you don�t need to know really, but may help: <li> is an html tag meaning start a line of text and </li> means this is where the line of text ends. <del> is another tag meaning draw a strike line through the following text, and </del> defines where that strike line ends. But, the most important part to understand is how html links work: <a href= �folder/subfolder/file.mp3�>Link Text</a> means the part in quotes is the location of the file that is linked to when the user clicks Link Text. The line <ul><li><font color = "maroon">Messages will be uploaded 1 Day after given</font></li> is something can be added temporarily if you want to get the index.htm all ready beforehand so that during the conference all that is left to do is actually uploading the messages. 12) To upload messages, first make a new folder within the proper location. Note that we replaced /Apr2012/ with /Dec2012/ in the text above. We will now make that new Dec2012 folder by first clicking on the Messages folder, then opening the EdMarks subfolder, and then right-click in the area at right, and finally selecting Create Directory, the naming the folder Dec2012. We are now ready to upload a message file. 13) To upload the file msg01.mp3 on my computer to the Dec2012. Folder on the website, we first click on that Dec2012 folder. This is important since it indicates where the upload will go in the next step. 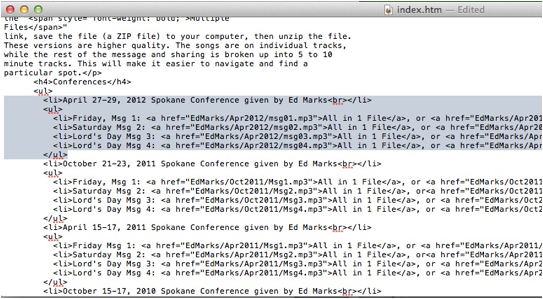 14) Now, locate the file msg01.mp3 to highlight it. 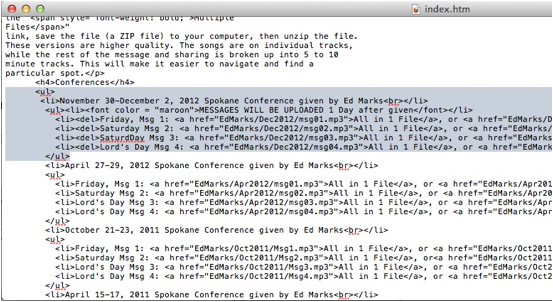 See the image above where both msg01.mp3 and Dec2012 are now highlighted. 15) Click the right green arrow to transfer the file to the Dec2012 folder. The upload can take a while; there�s a progress bar in the lower right. 17) Finally, check the website to make sure everything works for the user! If it works, congratulations!